It may seem at times like new L.A. restaurants are popping up like proverbial toadstools. Probably because they are. But what about those ‘old faithfuls,’ the tried and true classic, old-time L.A. eating eateries that Angelinos — young and not so young — continue to frequent to this day? Here at EATERIES, DIVES & JUKE JOINTS, we have a special interest in any kind of eating establishment that has a history, especially if that history is connected to some intriguing story or stories. Some of these I remember from my childhood, and others I visited when I occasionally passed through L.A. between here and there. I don’t make any claims for this being an exhaustive survey, but at least it will offer you a start. So let’s have a look at a few of the places that still exist in Los Angeles, and put them on your list of things to do next time you’re there. Or if you live in or near Southern California and haven’t yet checked them out, why not start now? Nate ‘n Al opened its doors in 1945, but the idea truly began more than 20 years earlier. Al Mendelson had moved from his native Russia to Toronto and eventually Detroit. It was there in a famous Motor City deli that he met his partner, Nate Reimer, and the idea of opening their very own deli was born. The two men set their sights on Southern California. Sunshine, movie stars and a bright future awaited them. 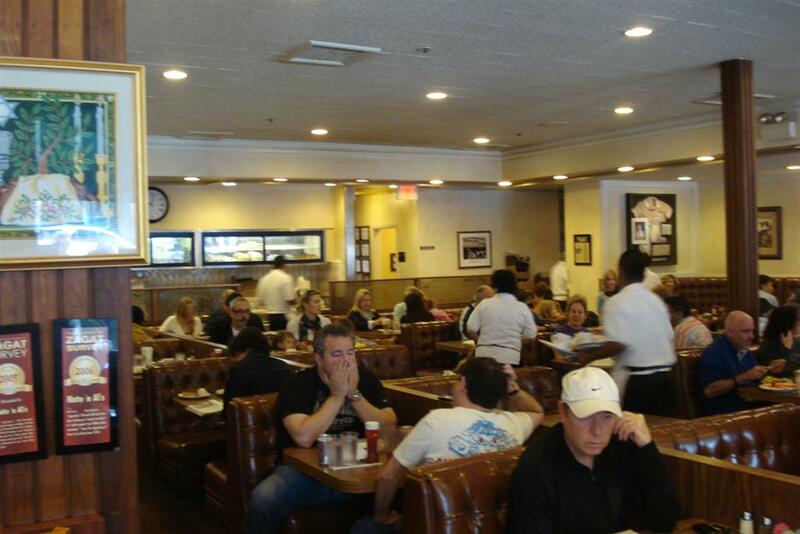 Once they arrived, Nate and Al opened the Beverly Hills location that held a mere 30 customers. Yet, despite its humble size, the deli began to grow big in name. Silver screen starlets. Directors. Producers and writers. They all began to make Nate ‘n Al a Hollywood hangout. It was during this boom that Al expanded the restaurant to its present size. And while Nate would eventually leave the business, Al was surrounded by a strong family including his wife Terry, sons Barry and Sandy, and grandsons Mark and David who still operate Nate ‘n Al today. Besides its many illutrious and not-so illustrious customers, it has been the long time haunt of former CNN anchor, Larry King, who still occasionally drops in. Who could resist? Pop in some time and try their delicious and authentic whitefish salad, roast beef sandwiches and potato knishes? 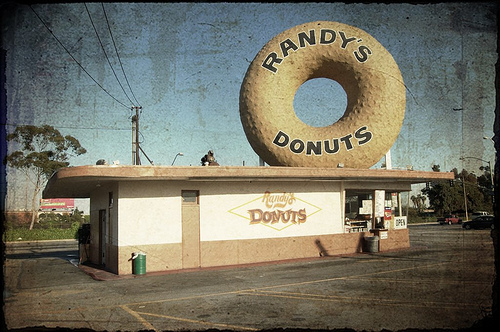 RANDY’S DONUTS You can’t miss this famous L.A. dessert haunt as it’s just about the least subtle joint in the City of Angels. The giant donut is a international icon and a familiar real-life sight for anyone on their way to or from LAX. It’s made cameos in movies and been around since 1952. Strawberry-jelly-filled and chocolate raised donuts are on the ‘menu’ and make a delightful accompaniment to a cup of joe. Or you can just stand there in awe of the giant donut (you wouldn’t be the first). BTW – in case you were wondering – Randy’s has a long association with the movies. It has been featured in Earth Girls Are Easy, Mars Attacks!, Golden Child, Into the Night, Coming to America, Stripped to Kill, Breathless, Love Letters, California Girls and many many more. 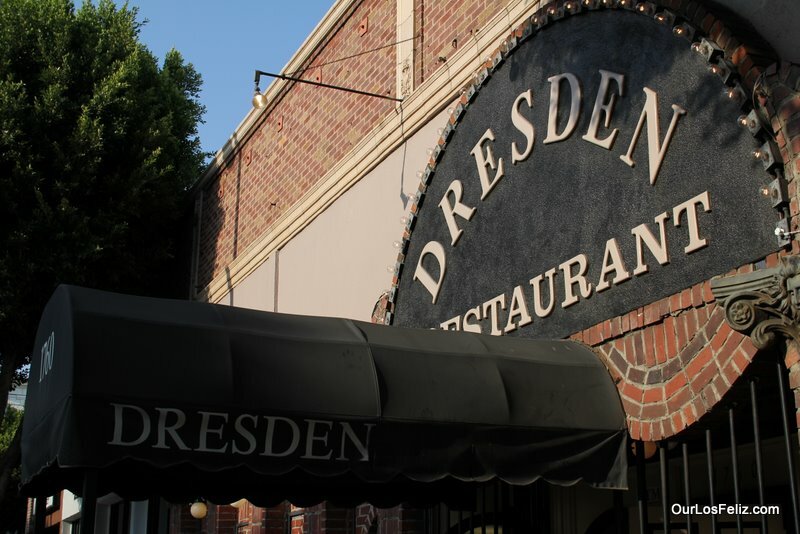 THE DRESDEN RESTAURANT Perhaps not as well known for its dining options as it is for its lounge scene, The Dresden has provided entertainment (and some grub) to generations of Angelinos. It was first opened in 1954. The ‘cool cat’ pad has appeared in movies like Swingers and The Two Jakes. Jazzy duo Marty and Elayne can still be seen there drawing a crowd. The lovebird lounge lizards — who started playing there in 1982 — are practically synonymous with The Dresden. 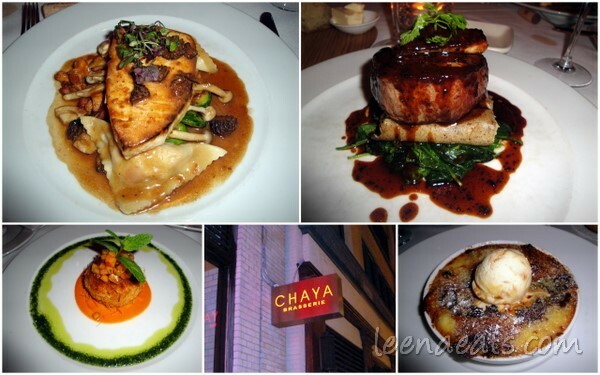 CHAYA BRASSERIE Chaya has come a long way from its humble roots as a great local hang (especially its famous Venice location). These days, it’s fully updated its menus to reflect a decidedly fashionable fusion sensibility. 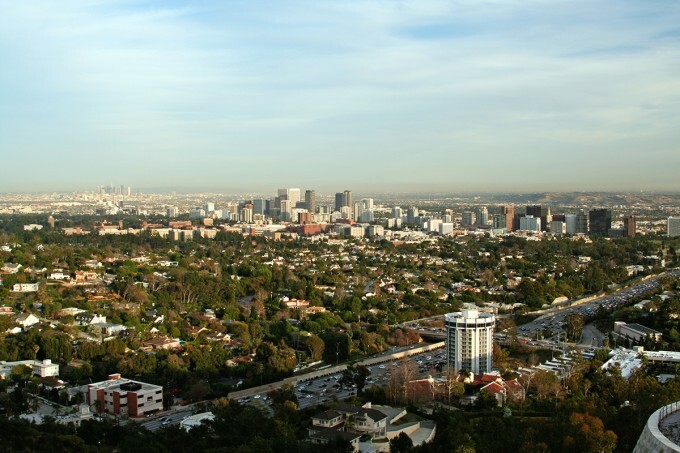 It boasts locations in Beverly Hills and San Framcisco as well as downtown L.A. And don’t forget Venice Beach. Although the eatery’s history technically goes back hundreds of years (via the Japanese family that founded it), the incarnation of it that’s known to Angelinos dates back to the early ’80s when its Los Feliz and Beverly Hills restaurants opened. 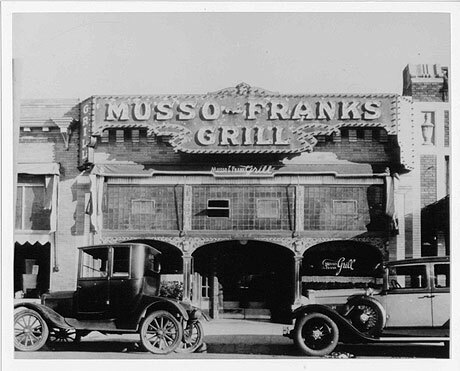 Any local LA kid who wants a delicious sirloin steak has to think of Musso and Frank. At least this LA kid does. The oldest restaurant in Hollywood first opened in 1919 (even prior to the film industry’s golden age!). 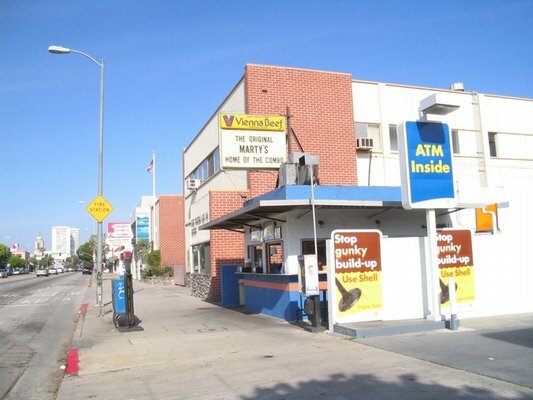 Through the years, its clientele has consisted of the likes of Raymond Chandler, Charlie Chaplin, and Douglas Fairbanks. Oh, and they make the best Tom Collins in LA. MARTY’S HAMBURGER STAND This fine burger stand (with seating at the back) is unobtrusively located between the fire station and the gas station on Pico Blvd. near Prosser. I went to grade school in the vicinity and the promise of one of their famous Combos when that three o’clock bell rang was magical. The Orange Juliuses, the burger grill with its patina of decades-old grease, the friendly firemen from next door–all are part of Marty’s classic old LA vibe. They’ve been frying them up for the best of them since 1959, and will (I suspect and hope) be doing so until 2059. THE IVY The Ivy’s Robertson Blvd. 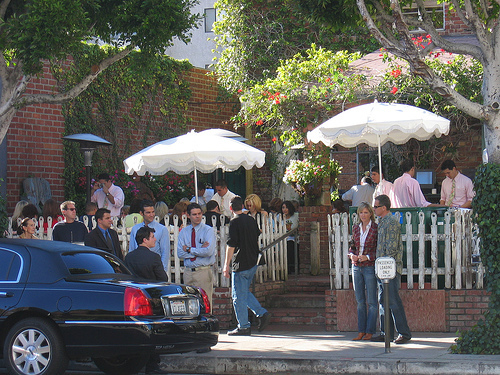 flagship (not to be confused with the Ivy at the Shore) was featured in the movie Get Shorty. The restaurant had quite the reputation–especially in the height of the glitzy ’80s–for being impossible to get into. After all, stars like Kiefer Sutherland and Anjelica Huston dined there, and warm owner Lynn von Kersting was always there to greet her friends. Mostly known for its charming rose-adorned patio (and the show of valets and high-end cars in the front), it still retains caché although it’s not so hot anymore that the waiters can chase after low-tipping diners like they did in the good ol’ days. BOB’S BIG BOY This Bob’s restaurant was built in 1949 by local residents Scott MacDonald and Ward Albert, and is the oldest remaining BOB’S BIG BOY in America. It was designed by renowned architect WayneMcAllister, incorporating the 1940’s transitional design of streamline modern style while anticiapting the free-form 50’s coffee shop architecture. 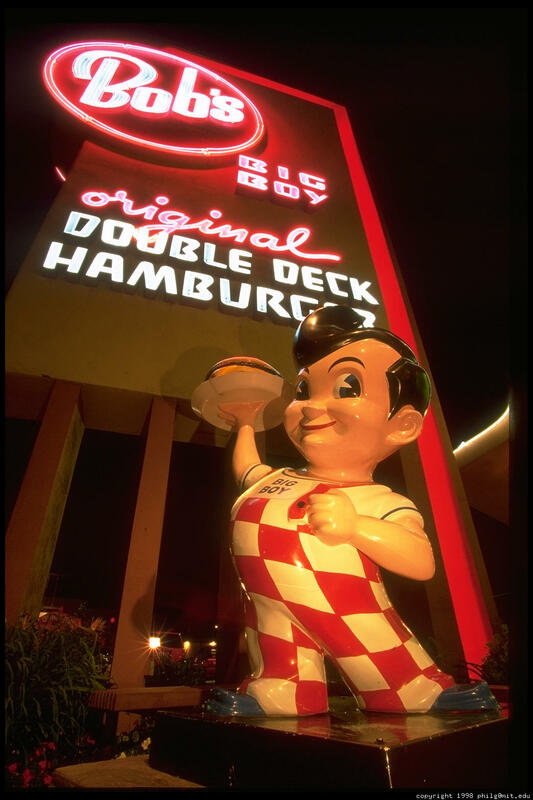 The towering BOB’s sign is an integral part of the building design and its most prominent feature. The restaurant was honored in 1993, receiving the designation as a “STATE POINT OF HISTORICAL INTEREST” by the state of California. Like many LA folks, Bob seems to have aged quite well. The young lad is a famous fixture in the San Fernando Valley as is this fast food relic. Today, it continues to attract gear-heads and hot rod betties who come for more than just “The Big Boy” (their famous double-decker burger). It’s quite the scene on Friday nights.